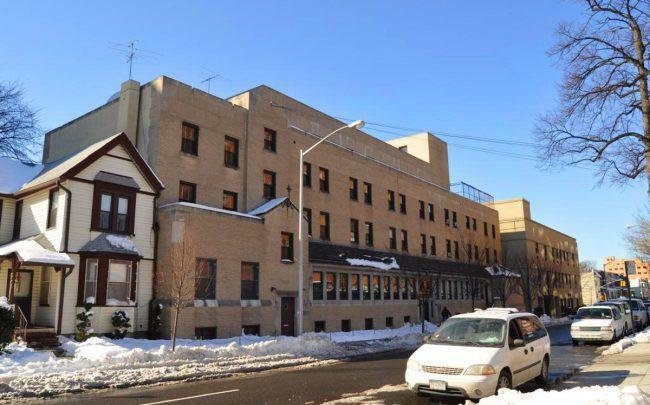 Barone Management has purchased a pair of sites in Queens’ Jamaica neighborhood for $20 million and plans to use them for a charter elementary school and two new residential buildings. Barone closed Monday on the purchase of the land parcels at 89-25 161st Street and 89-25 162nd Street, which together have more than 295,000 buildable square feet, according to representatives for the company. It acquired the sites from the Sisters of St. Dominic, a Christian religious order. The company is still deciding whether the residential units will be condos or rentals and market-rate or affordable, according to Barone Management founder Scott Barone. The 89-25 161st Street parcel includes the 70,000-square-foot building that was the former home of the Dominican Commercial High School, which the Sisters founded in 1936. It became one of New York’s premiere business schools for girls and later shifted to a college prep program. The Sisters of St. Dominic did not respond to a request for comment. The land also includes a convent building and a parking lot. Barone expects to complete its work on the sites in 2021. Although the high school is now closed, there are existing tenants on the property, including a Catholic Charities Head Start program. Barone said all tenants are on fairly short-term leases for between one and two years, and the company intends to let all of their leases expire on schedule and help them relocate. The Greater Jamaica Development Corporation anticipates that the area by Barone’s purchase will receive 3,000 new residential units, 500,000 square feet of retail space, and 800 hotel rooms over the next five years. Other recent deals in the neighborhood include BRP Companies’ $55 million purchase of 163-05 and 163-25 Archer Avenue and Zara Realty’s purchase of 88-22 Parsons Boulevard and 89-21 153rd Street for $19.5 million. Barone is also planning a warehouse in Long Island City at 9-03 44th Road for small businesses.